Save Money with free shipping! 6121 Canvas Tents from Kodiak Retail for as little as $529 elsewhere online! Camp in comfort and style with this high quality cabin tent from Kodiak Canvas. It is ideal for those extended use occasions. Made with premium grade, Hydra-Shield! 100% cotton duck canvas. Storm flaps are on the outside and will zip up from the upside. The canvas or awning is sewn onto the roof and is supported by a sturdy metal frame. The tight weave and silicone finish make this canvas watertight yet breathable, minimizing condensation and mugginess. Go ahead and touch the inside walls during a downpour - this canvas will not wick water. The robust 1 inch steel tube poles with welded corner braces will hold up to the weather. The floor is a super-duty, puncture resistant, 16 oz vinyl with welded seams that keeps water out. The tall ceiling (7.5 Ft at peak) and steep walls (5.5 Ft at sides) provide a roomy interior with stand-up, walk-around comfort. A large front door and 2 side doors with heavy-duty #10 zippers offer convenient access. 6 large windows allow ample air flow, and have no-see-um screen mesh, keeping out the smallest pests. 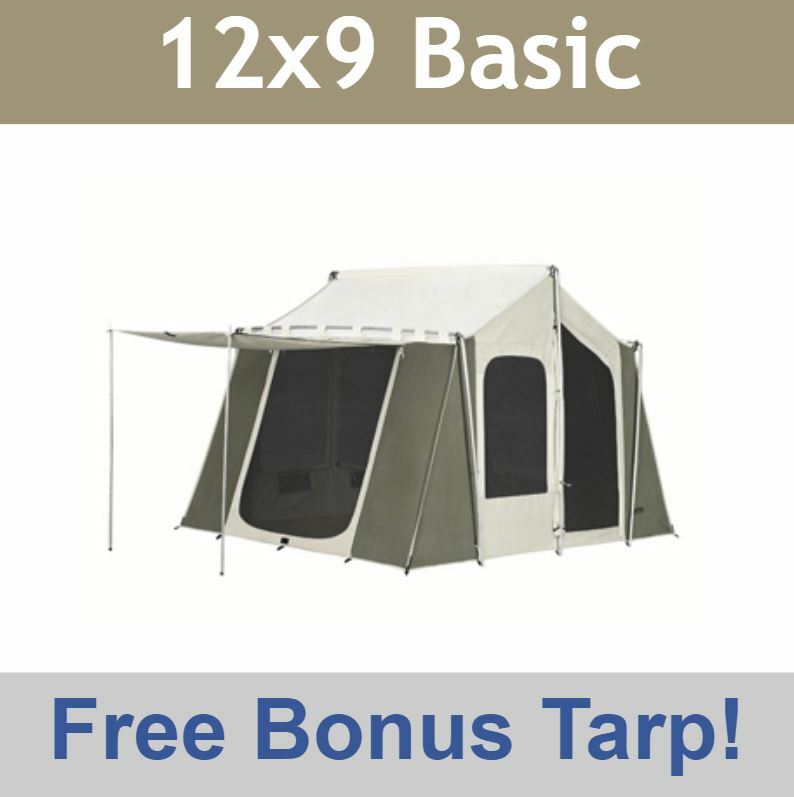 Limited lifetime warranty on the Hydra Shield Canvas Tent. 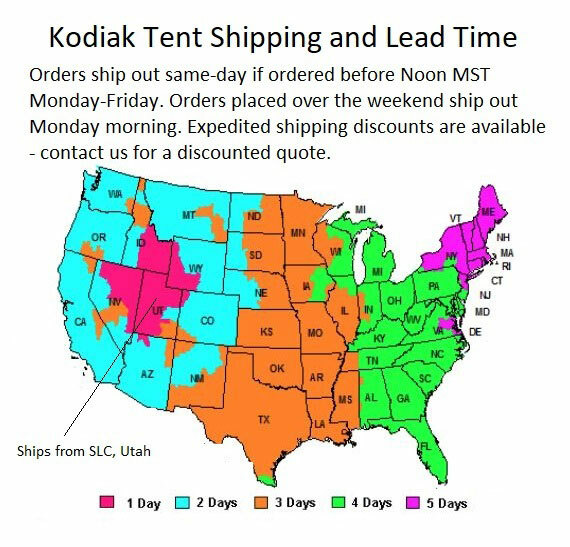 Kodiak Canvas Tent Camping products generally ship via FedEx. Hydra-Shield, 100% cotton duck canvas; watertight, breathable, durable. 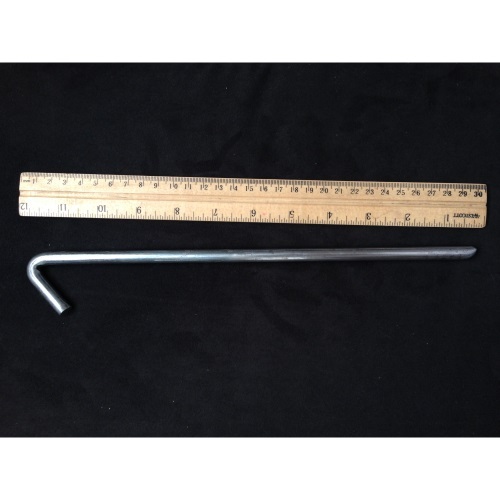 Sturdy, heavy frame with reinforced welded corner braces. The main, front door opening is on the 12 Ft. side. Spacious 7.5 Ft peak ceiling height and steep walls. Large D-shaped front door, and two side entries; use heavy-duty #10 zippers. Large windows with no-see-um mesh. Side Awning measures 6 Ft by 5 Ft and zips closed to cover the large window below it. It's water tight. Side walls roll up for openness and ventilation, or extend out with poles to convert either side into a small awning. Kodiak Camping Tents Include Heavy-Duty, 12 inch, steel rod, tent stakes. Newly redesigned metal-reinforced stake loops included. Unlike many other stores, Competitive Edge only sends these with the new upgraded improved metal reinforced stake loops. Approximate Weight: 87 lbs. (Includes tent, poles, stakes, and storage bags). Ceiling Material: 10 oz Hydra-shield! cotton canvas. Wall Material: 8.5 oz Hydra-Shield! cotton canvas. Two adults required for assembly. How do Kodiak Canvas Tents compare with cheaper competitor canvas tents? The first thing is that Kodiak Canvas is the Cadillac of canvas tents so you may invest a little more for a lot more quality. One thing to compare is the tent weight. Some competitor 12x9 tents weigh about 69 lbs. This Kodiak Canvas tent weighs 87 lbs. That is 20% more tent for your money. Other canvas tents are 8 oz. Kodiak Canvas is 8.5 and 10 oz on the roof. Canvas is tricky because there are a lot of factors other than just weight. Kodiak Canvas has a silicone treatment that is breathable and very durable (i.e., it will be waterproof for years and years of use) and will not wick (draw moisture from the outside when you rub against it on the inside). Other canvas tents have the same center height 7.5 Ft (90 inches ) but the side walls on the Kodiak Canvas tent are 5.5 ft and others are 4 Ft. That is going to make a huge difference on inside room and comfort. This floor is a super heavy 16 oz vinyl with welded seams, almost unheard of in other canvas tents. On competitor canvas tents the 90 degree angle connector poles are a common failure point. Kodiak Canvas tents are reinforced with a welded brace and heavy duty tubing. Competitive Edge Products is an authorized reseller of Kodiak Canvas Tents. Number of boxes for this product: 1 Box (if ordering other accessories such as tarps and vestibules they will ship in separate boxes). Shipping dimensions: approximately 4' x 18" x 18". Ships via: FedEx or UPS. Doorstep delivery, No signature required for most residential addresses. If you are worried about the safety of your package please request a signature during checkout in "Special Instructions" at no extra cost to you. In such a case someone will need to be home to sign for the package. Contact us with any concerns. Lead Time: Generally ships out same day if ordered by Noon Mountain Standard Time. Shipping can take between 3 to 10 days depending on your location. Item ships from Salt Lake City, Utah. Damaged shipments are extremely rare. Should anything be damaged upon arrival please note that with the driver if possible or refuse shipment. We'll send out a replacement shipment or parts as required at no cost to you and we'll file the freight claim making it a painless process for you. Find a Cheaper Price? Let us know by e-mailing us at websales@competitiveedgeproducts.com Please be sure to include your zip code and we will try to beat the price. The competitor must be a legitimate company. 6121 is the new and improved version of the 6120. Owners manual available for model 6121 upon request. THIS TENT'S CONSTRUCTION IS OUTSTANDING! SHIPPING WAS EXTREMELY FAST! GOOD JOB! I needed item right away and received it two days early. Great seller! !!! 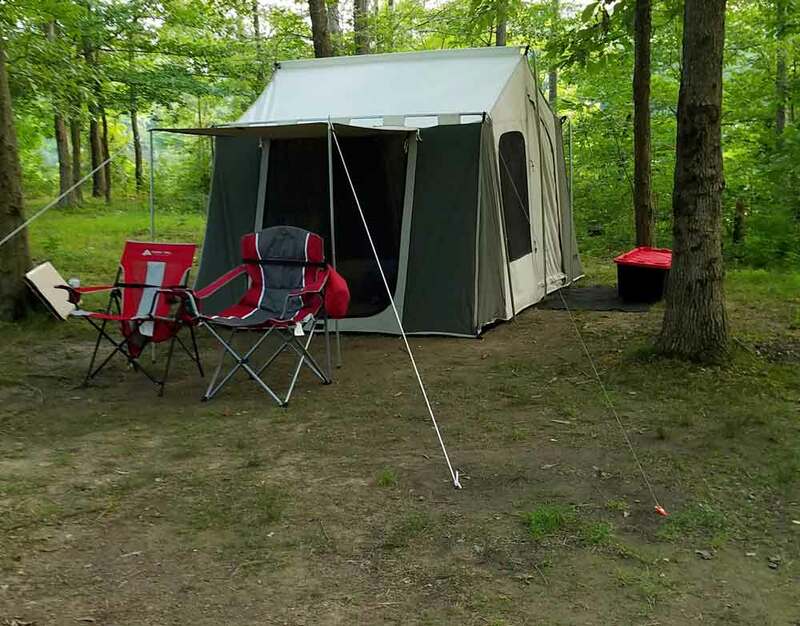 Even with your very accurate description of this tent, one does not realize how well this tent is constructed and what a first class product it is until you set it up and use it. First class all the way. Thanks. We got the tent, but have been waiting for good weather to set it up and wet it down the first time. It looks wonderful and I cant wait to get it set up!!!! I just did not want to wait any longer to review it. Wanted to get that e-mail out of my inbox! Q: Can someone better explain the floor options? Thank you. A: 1) the tent already comes with a 16 ounce vinyl floor 2) there is a ground tarp that is optional designed to go underneath the tent 3) there is an optional floor liner that is canvas that goes over the already included 16 ounce vinyl floor. Q: Does tent have a port opening to run an extension cord through ? A: Yes, the cabin tents do have an opening that zips open and closed allowing for an extension cord. A: It cannot be attached later as it is simply sewn onto the tent on the deluxe model 6133. Feel free to contact us with any other questions. A: They cannot be customized through us. They are simply mass-produced as you see them in the picture. Feel free to contact us with any other questions. Q: Does this tent come with the awning? A: Yes, it does have the smaller basic awning over the door on the left side. 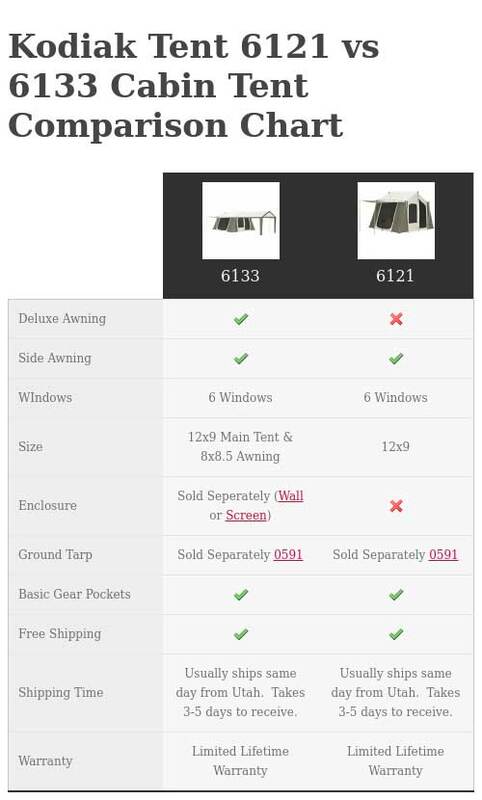 The deluxe model has the 8' x 8.5' attached awning and that is model number 6133. Feel free to contact us with any other questions. Q: I am interested in the 6121 model. I live in Salt Lake. Do you offer a discount if we pick it up instead of having you mail it out? A: Yes we do have local pickup discounts. Q: what is the dimension of the main door opening, H X W ? A: Which door do you consider the main opening? The largest door is the one shown on the left of the main image on the 9 foot side. I don't have the exact dimensions were, but I am able to fit a queen-size mattress fully inflated through that door. The other door on the right side of the main image is much smaller. It's closer to about 5 feet high by 30 inches wide. They are a little bit forgiving since you can pull them open wider. Some people with wheelchairs can go right in even though there is a slight lip at the bottom. 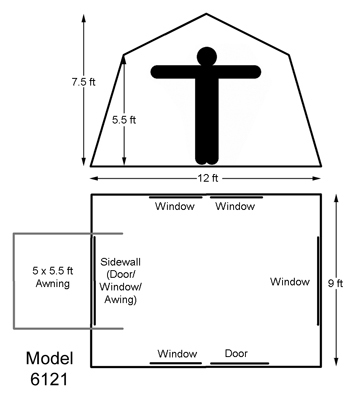 Q: How does the enclosed room fit to this tent? A: the model that includes an enclosure option is the deluxe model 6133. This is the basic model, that is the deluxe model. Q: Have 8 x 8 ft hot tub in the backyard where wind can become bothersome. I would like a canopy tent with enclosure over the hot tub, preferably clear windows but must keep wind out. What do you recommend? A: Unfortunately, we don't currently have something like that that would work. In the next few weeks we will be selling items made by Shelter Logic and they likely have some type of canopy that might accommodate your needs. Q: When will it be delivered? A: The ship out of Salt Lake City Utah and only takes a few days to receive. We ship them FedEx ground. A: The carry bags on the Kodiak tents are exceptionally large, and usually have seem for everything, and the additional tarp as well. The tent also has a separate pole and stake bag if you wish to carry them separately. Q: Is this cabin tent as strong as the bow flex tent ... which would be the better tent for living in about 3 months during this summer? A: Both the cabin, and the Flex bow are made of the same durable material; however most customers find that the flex bow tents are easier to set up than the cabin tents due to the pole design. Personally I would recommend the 6133 for extended use, as it is the largest tent, and provides the most space for gear and things. None of these tents are designed to be used for that long, and keeping it up for more than a month at a time would void the warranty. Q: Need a 4 person heavy duty tent 6 feet high, 31 pieces in green color suitable for forest camping for export to Ghana. Need your best price? Q: Is the front awning an option that can be added later or do you have to buy the tent with awning attached ? A: Unfortunately, it is not an option that can be chosen later. It sewn onto the tent when you purchase model 6133. That is the only way to get the deluxe awning. Q: Would like to put a portable A/C in tent. Is there a way to vent outside? Vent is tube and made to vent out of either square or oval shaped opening. A: You might want to contact the manufacturer regarding that. 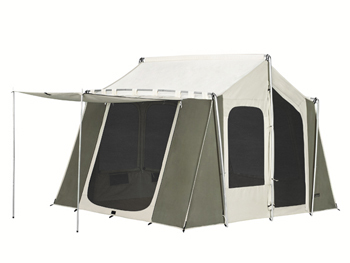 Q: Can I attach the front full enclosure to this tent or do I need a different model? 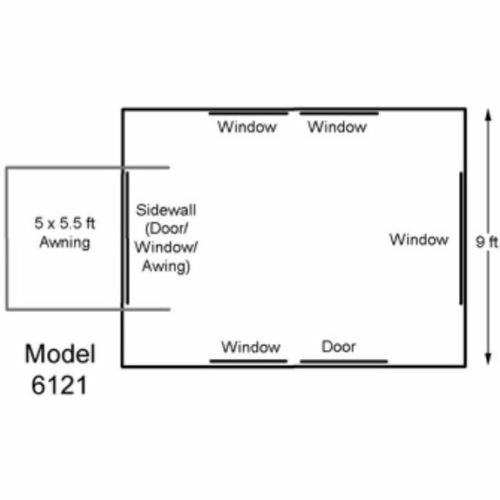 A: This model does not include the deluxe awning and therefore does not accommodate the enclosure. There is nothing to attach it to on this model. You're thinking of model 6133. Feel free to contact us with any other questions. A: I think you are fine. You should have it with several days to spare. We will know more as that date gets closer. Q: Is this Kodiak tent supposed to be shipped with the handy strap-and-cinch storage bag that allows for a convenient roll up? A: No, the cabin tents do not have a cinch and strap storage bag. They have the Duffel style. Q: Would this tent fit on a 12x16 wooden tent pad that is raised a half a foot off the ground? A: If you are able to stake/drill into the platform I don't see why it wouldn't work. Q: Awning very confusing, as it does not show if you can close that window, or if that awning flap down is the only way for privacy. Can you please explain this? Does that window close from inside the tent the same way the rest of them do? A: The awning can only be closed from the outside and it also functions as the window cover flap. The window/door beneath the awning can be opened from the inside or outside. All of the other Windows close from the inside. Q: Do you ship this item to Spain for free? A: We do not ship to Spain. Q: Kodiak Canvas Tent 6121 12X9' Cabin 6 Person Camping Tents All-Season ??????????? ?? ??????? A: What is your question? Q: Do all of the windows have a canvas flap to cover in cold weather? A: Yes, every window has a canvas flap to keep it watertight. Q: Does it absolutely take two to set it up? A: It definitely does not require two people to set it up. I have set this up more times by myself than with help. You simply need to telescope the poles incrementally instead of one at a time. Q: Forget my question... I read your published questions and got my answer. Thanks? A: It most definitely can be set up by one person. Q: Will this tent sleep 6 people plus some bags for belongings? A: Yes, a 6-person tent assumes sleeping space for 6 people plus some gear storage. However, depending on your sleeping arrangements (e.g. cot vs. camp pad sleeping) and the amount of gear you need stored, you may fit more or less people than this. For a better idea of how well you and your family will fit in the tent, please view the layout picture and diagram your space needs. Q: How many people does it take to put up this tent? A: This tent can be put up 1 person, but is much easier to put up with at least 2 people. Q: Will my children be able to help put up this tent? A: We recommend only adults assist in assembly. Q: Will this tent hold up in extreme wind and rain? A: These canvas tents have been tested up to 40 mph though we do not recommend camping in such extreme weather. If the wind gets bad enough regardless of the tent or brand name your poles will simply bend. Replacement parts are available. It does take incredible storms to damage these tents. Nylon tents can be damaged in storms with wind gusts of 20 miles per hour. These are double that or more. Q: Will this tent keep out all critters? A: This tent will keep out almost all critters. Be sure to keep the doors it closed. I went camping with a friend who left a small opening only to find a raccoon trapped inside his tent in the middle of the night. Luckily, it was able to find its way out. This does keep out insects, rodents, snakes, etc. The key is to make sure that you zip the tent closed completely. Q: How fast can this be put up? A: This can be assembled in about 10 minutes. The first time you assemble it will take closer to 15 or 20 minutes, however. You do not need two people to assemble this, but the first time you assemble it you will be glad to have a second person handy. It also only takes one person to disassemble the tent. A: 1._ Is the tub of this sown all the way around the tent bottom? 2._How many tie down ropes are on the tent and staking loops are around the bottom? Sidewalls roll up for openness and ventilation, or extend out with poles to convert either side into a small awning. Kodiak Camping Tents Include Heavy-Duty, 12-inch, steel rod, tent stakes. Dimensions: 41" x 13" x 13"